Tumors of the spine are comparatively uncommon, but the consequences can be disastrous. Therefore the possibility of a tumor in a patient presenting with low back pain should be kept in mind. Tumors producing lower back pain can be either benign or malignant; they can be either primary or metastatic; they can be in the bone, in the epidural space or inside the thecal sac. Primary tumors of the spine or its contents are rare, but metastatic tumors are not uncommon in older age groups. Metastatic lesions most often involve the bone, less often the epidural space, and rarely metastatic lesions may be intrathecal. 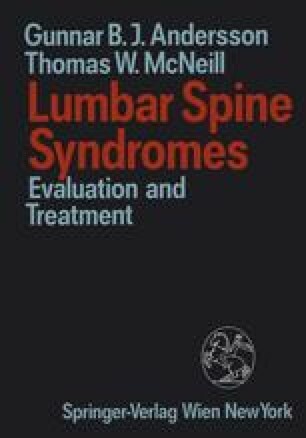 On occasion, tumors involving the pelvis can mimic one of the lumbar spine syndromes, and tumors of the lower extremity can mimic sciatica (Boland et al., 1987; Mindell, 1981; Schajowicz, 1981; Sim et al., 1977; Simone and Lawner, 1982; Weinstein and McLain, 1987).